In the event that a careless driver backs into your car, they are not at fault—you are. Or put clearly, that’s typically the opinion most police officers will give. But if you had a 360-degree camera installed in your car, it would provide an incontrovertible proof of what actually transpired. 360-degree dash cameras are gaining popularity as a way to provide rock-solid evidence of what actually happened during a collision with another driver. 360-degree dash cameras have become the go-to choice for many drivers. In this roundup, we will discuss the best 360-degree dash cameras that are worth buying. Be sure to check out our article on the 6 best 360-degree USB cameras that won’t break the bank. The Falcon Zero F360 is a high-quality and high-definition digital camera exclusively made for cars. 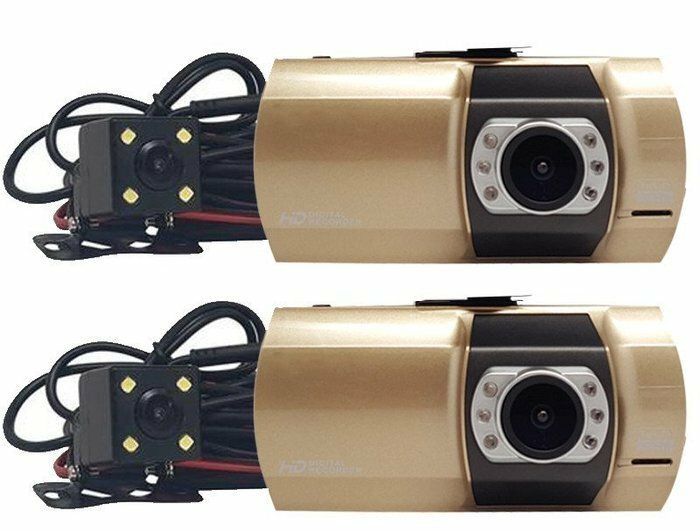 It comes equipped with twin cameras both rotatable through 1800 and an excellent 1200 viewing angle to ensure all angles are covered. Having said that, the cameras can be positioned in a number of different ways. That means you can face the lens in opposite directions or have one record the action happening at the front or the view from the sides. Furthermore, you can set the recording to rear, front, or both at the same time. Unlike other DVR’s, the F360 comes with 3.5-inch LCD screen so you can preview what is being recorded. The camera supports up to 32GB SD cards, HDMI, and TV output. Loop recording ensures that you will never run out of space by replacing old files automatically with new ones. Other useful features include built-in microphone/speaker function and Night Vision mode to enhance recording at night. The WISEUP dashcam is one of the high-end 360-degree dash cameras and comes with 4 cameras to cover all angles. The 4 wide-angle camera setup delivers 360-degree panoramic view eliminating nearly all the blind spots, so the driver can easily maneuver in areas with limited visibility. Each of the four cameras has a 1200 field of view with IR night vision (rear view camera) for enhanced visibility at night. The included 7-inch TFT LCD monitor records at a video resolution of 800 x 480. The monitor is well configured such that the video screen switches automatically according to the driving directions. The camera supports a maximum of 4ch video outputs and 4ch real-time video recording and display. Additional features include support for microSD cards up to 64GB and PAL/NTSC TV support. 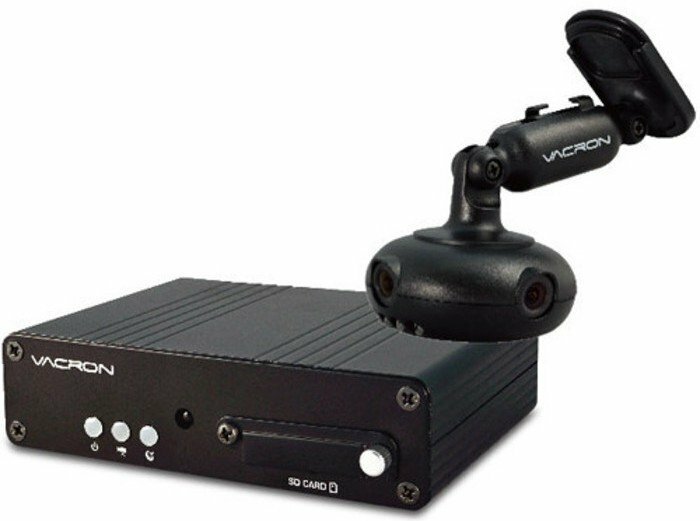 Equipped with an in-car DVR, integrated GPS, and a camera with 4 lenses, the Vacron 360 is undeniably one of the top 360-degree dash cameras. The Vacron, which has already won a global recognition, is capable of recording 360-degree videos at 30fps. It uses a combination of powerful CMOS sensor, inbuilt infrared LEDs, and the 4-in one camera to ensure that nothing escapes from the scene. In addition, it records the G-Sensor readings along with the images. The clear and lucid menu interface makes reading a piece of cake. You can save the footage directly to an SDSC memory card and later transfer it to a computer. There is a CarBox software included that you can use to easily backup files and transfer them to a computer. The Vacron 360 is programmable, which means you can set the camera to record even when the car is packed. This can be a very useful feature, especially when you want to extend the surveillance of your car. 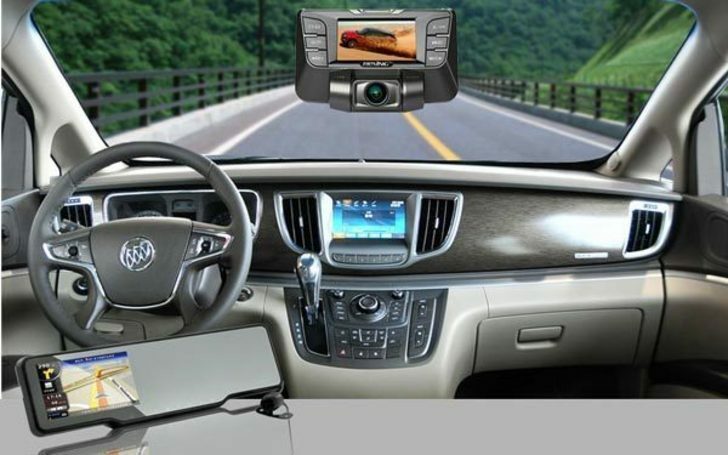 To capture every angle, in all directions, and at the same time, most dash cam manufacturers have embraced the idea of utilizing multiple cameras. The Falcon Trucker Dash cam is the epitome of this concept and comes with 4 high-quality 1080p cameras that deliver 360 degrees of coverage. 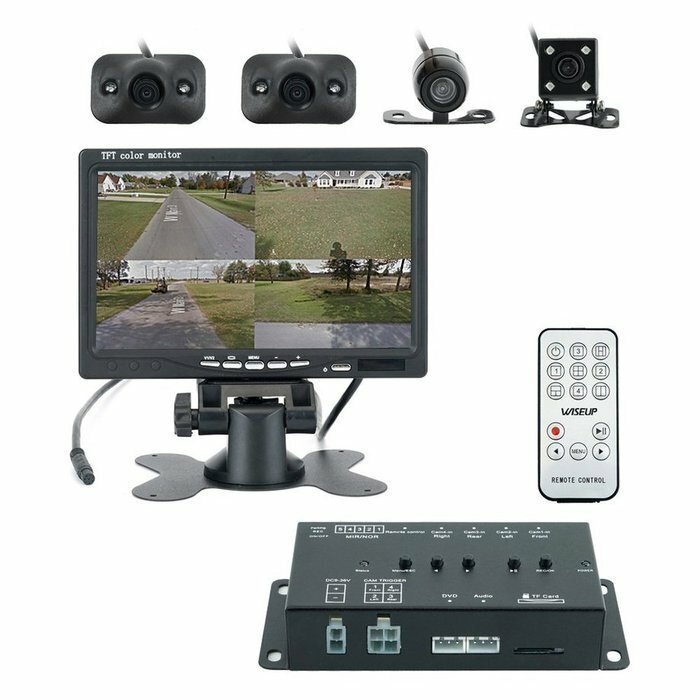 With the included 4 cameras, the Trucker Dash can record 3-4 viewpoints at the same time, so you won’t have to worry about what is happening behind you or sideways. The camera’s set up is easy and straightforward. The front facing camera will give you a 1800 view of what is happening in front of you. Plus, you also install waterproof cameras on each mirror facing backward and sideways to get a full 360-degree coverage. All in all, the Falcon’s 4-camera system delivers a full coverage of your surroundings in high-definition. You are also entitled to a 30-day money back guarantee so you can buy with confidence. 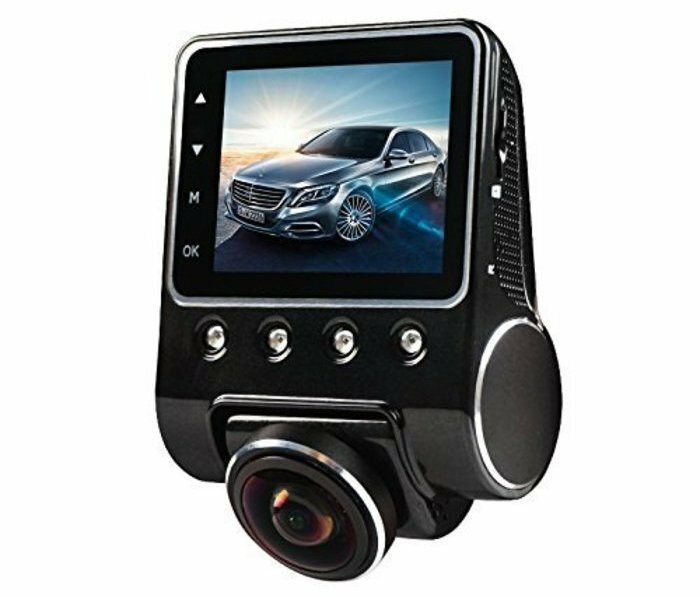 The Morefine 360-degree car camera offers full 1080p recording at a smooth 30fps with panoramic night vision. The camera sports powerful CMOS sensor and a wide angled lens capable of capturing 360-degree spherical panorama images. It also packs a wealth of smart features, which are very convenient for every car owner. Among these includes recording with G-Sensor and a feature that automatically switches off the display when the engine is off. The Morefine dash camera is also equipped with a 2.5-inches display, so you can preview what the camera is recording in real time. You can either view the recording in full-screen mode or split screen the display. The camera supports microSD cards up to 32GB, class 10 cards recommended. The loop recording feature automatically overwrites old video files with new ones so you’ll never run out of storage space. Additional features include accident auto detection, built-in speaker, and microphone. 360-degree dash cameras have begun to gain popularity due to the exclusive features they offer, and soon we will be seeing more and more hit the market. They come in many shapes and sizes, and each model incorporates its own unique features. Some come with powerful CMOS sensors, some have inbuilt GPS and Wi-Fi, while others take a form factor. When buying a 360-degree camera, it’s important to consider the features you want in place. You can use this article to guide you in buying the best 360-degree dash camera in the market today.